My Mom found some of the Taro in our pantry sprouting. 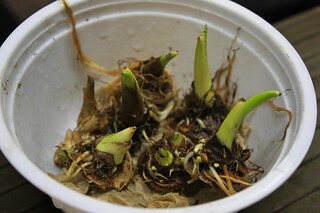 She cut of the growing tips, placed in a bowl with a damped towel and covered with a pastic bag to keep it moist. This evening I took the Taro tips and planted them temporarily in a big cell pack with potting soil, so the root will grow and develop.